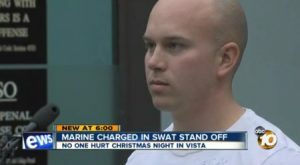 A Camp Pendleton-based Marine who shot up his apartment in Vista on Christmas night and prompted a standoff with sheriff’s deputies, pleaded guilty Thursday to a felony charge of shooting at an occupied dwelling. Christopher Michael Johnson has been accepted into San Diego’s Veterans Court program, which helps members of the military with mental illness get treatment and make it back to the community as a productive citizen. It’s up to Judge Carlos Armour whether to allow Johnson to go into the program, said Deputy District Attorney Marnie Layon. He also could opt to sentence the 26-year-old defendant to as much as seven years in prison. As a condition of bail, Johnson, who has a minimal criminal record, must continue to abstain from alcohol, not possess any firearms and stay confined to the Camp Pendleton base pending his May 15 sentencing. He must also continue to wear an alcohol and home-detention monitoring bracelet, Layon said. Johnson fired multiple rounds from his .44-caliber magnum revolver inside his apartment in the 900 block of Taylor Street in Vista around 11:50 p.m. Dec. 25. No one was injured in the incident. Sheriff’s deputies attempted to contact Johnson by phone and via a public address system, Ness said. The Sheriff’s Special Enforcement Detail was called to the scene after Johnson failed to respond.